Correctional Medicine Is Different: Our Patients Don’t Go Home! This post is the final in a series exploring how Correctional Medicine is different than medicine practiced outside of jails and prisons. The previous three differences were The Principle of Fairness and All Clinical Encounters are Discussed Back in the Dorms and We Can’t Fire Our Patients and They Can’t Fire Us! The final major difference between correctional medicine and medicine in the outside world is this: Our patients do not go home. We have a captive audience. Literally! Believe it or not, this is a very important medical point. Back in my previous life as an ER doc, if I asked a patient to come back tomorrow to be rechecked, I knew that few of them would. It was just too much hassle. They had to find a ride back to the ER (especially hard for the homeless or those without cars), they had to endure another prolonged wait in the ER waiting room. And they would be charged big bucks for another ER visit! No wonder so few of my scheduled follow-ups actually returned! Once I began to practice in a jail clinic, I soon realized that the situation is much different. The patient I see in clinic today will not go home. She will go to her housing dorm down the hall. I know exactly where she will be tomorrow–or in a week. If I want to see her again tomorrow, I can. In fact, I can reliably see her in follow up anytime I want to. One might think, “So what? What difference can it possibly make on the practice of medicine that our patients do not go home?” The answer is that this fact does indeed have several important consequences for the practice of clinical medicine. I can think of at least four. Since I can see any patient back any time I want, I can easily do much more frequent check ups than I ever could in the ER. Consider the case of a random patient who I have evaluated in the ER for abdominal pain. Based on just the history and physical exam, I am pretty sure that there is no emergency here and that this patient does not need to be admitted. But “pretty sure” is not the same as “100% sure.” I would really like for him to be rechecked tomorrow. I’m afraid, though, that he won’t come back tomorrow, for any or all of the reasons I mentioned above. Once I let him go out of my sight, I probably will never see him again. So instead of sending him home with the plan of a recheck in 24 hours, instead I (and my ER colleagues) would do “The ER Thing:” tests, x-rays and labs. We knew that most of these are of questionable value. But ordering them has one important benefit–it keeps the patient in the ER for several hours! That way I can recheck him to see how his condition changes over time. But in corrections, I can do things quite differently. I don’t have to order labs, x-rays and tests to keep him around for serial examinations. I know exactly where he is going to be. I can arrange for him to be re-evaluated in 8 hours, 24 hours or whatever time frame I want! I can have the jail nurse check on him hourly, even, and call me with vital signs. I can bring him back to clinic tomorrow—or in a week. And I know that it will happen! I call this concept “The 8 Hour Test,” and I have discovered it to be an essential medical test. I now use it all the time. It is important to consider this test—the Test of Time–should be considered to be a true medical test. The objective is to evaluate how the patient’s condition changes over time. And it will reliably change. In 8 hours, patients will either be improved or worse. Either result tells me a lot about their condition! Being able to reliably do a Time Test makes me more confident about what is going on and less likely to order meaningless tests. We don’t have to worry about this in jails and prisons. Our patients are checked on daily by a variety of personnel. Patients who take medications are seen every day during med pass. Correctional personnel check on inmates daily during head counts, at recreation and during meals. I have lost count of the times that some jail deputy alerted me to a medical problem by saying “You ought to see this guy—he doesn’t look too good!” It is not uncommon that the sickest patients will not put in a kite or complain. Thank goodness for the jail deputies who look out for them! May all jail deputies have a Merry Christmas for the good work they do. Not only that, but patients are are available for their routine screening exams. It is very common in outside practice to “lose” patients. They just stop coming in for their appointments. Most of the time, the doctor does not know why. Did he move? Die? Find a different practitioner? Or just decide that going to the doctor for check ups was a hassle? This does not happen in corrections. Even if the inmate has forgotten that he has a clinic appointment, someone will remind him. And why not go to scheduled check-ups? It’s not that much trouble—and what else is there to do? Of course, some inmates do refuse to be followed in chronic care clinics, but this is uncommon. The result of this is that prisons routinely achieve medical goals much more than do outside clinics. Take the goal of getting diabetic A1Cs below 8, for example. A typical outside primary care practice can expect 50% of its patients to achieve that goal. But prisons typically set (and achieve) 90% compliance with that goal. One of my jail patients once hobbled into my clinic and said his chronic back pain was so bad that he could barely get out of bed to eat. In fact, he struggled mightily to even get up from the waiting room chair. He insisted that the only solution was for me to prescribe oxycodone just like his outside doctor. He seemed to be in tremendous pain. But–somehow, something didn’t add up in my mind. I was suspicious. So I strolled down to the housing dorm to see for myself just how disabled this patient was. As it turned out, he was at rec playing (yes, you guessed it!) basketball! I arrived just in time to see my patient execute a perfect reverse lay up! True story. Contrast this with outside doctors who have no way to verify the stories that are told to them. If a patient says he cannot play golf anymore, is that literally true? My friend the orthopedist once told me about a patient of his who reported that his back pain was so severe that he could no longer play golf. The orthopedist increased his pain prescription and scheduled an MRI. However, the very next day, he read in the paper that this patient was doing very well in his weekly golf league. We don’t have this problem in jails and prisons. We can easily get details about our patient’s behavior. If our patients tell us that they are having trouble walking, we can observe them in the dorms to see how well they move. If our patient is not meeting his diabetic goal, we can check his commissary purchases. We can even see how compliant our patients are taking their prescribed medications, simply by checking the Medication Administration Record. I am continually amazed at the medical pathology I see in jails and prisons. I often am the first doctor many jail patients have seen literally in years. Here is a typical encounter: “Hi Doc. I’ve had this bump on my arm for a long time.” Jail doc: “Well that’s a cancer . . .” Outside of a homeless clinic in a big city, jail medicine affords a practitioner the unique opportunity to see lots of neglected medical pathology. Prison practitioners have noticed a similar phenomenon. 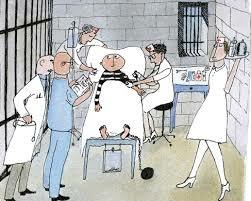 It seems that there are more interesting and rare diseases in our prisons than there are outside the walls. There is no research into this phenomenon that I am aware of, but I have talked to many physicians who believe that it is true, myself included. Docs who spent 25 years practicing internal medicine and then come to corrections say that there is a much higher incident of interesting, unusual and downright rare medical conditions in prison medical practice. Some have opined that this is probably due to less than healthy lifestyles that many inmates led prior to coming to prison. I personally think that a different factor is in play here. I think this phenomenon is related to the fact that our patients don’t leave out practices. Consider for example the hypothetical case of Dr. Smith, a community family practitioner, who has a patient that we’ll call Joe. Dr. Smith has taken care of Joe for twenty years. During that time, Joe has had some mundane, routine accidents, hypertension and other sorts of things followed by primary care. One day, though, Joe is discovered to have a rare case of metastatic cancer. What is very likely to happen next is this: Joe will become the patient of his oncologist, the cancer surgeon and the radiation oncologists. The oncologists follow him in clinics and hospital admissions. They are whom Joe calls when he has a problem. He may never see Dr. Smith again! But even if he does, it will be infrequent. Joe has essentially left the practice of Dr. Smith and become a patient of the specialists. This happens over and over again with all sorts of unusual disease processes. Once patients develop something big, they are then primarily followed by the appropriate specialist, whether a rheumatologist, neurologist or whatever. Their original primary care doctor will see them rarely. But this does not happen in prisons. Our patients with unusual and complex disease processes remain our patients. Sure, they’ll go out to see the specialist, but they always return to us. We are the ones who implement the treatments, prescriptions and recommendations of the specialists. We continue to see them in routine clinics—for years. We see them before, during and after radiation therapy. We watch them recover from surgery. We see what happens when, say; the rheumatologists try a novel drug. This is the real reason that there is so much more pathology in prisons than in outside primary care practices: because our patients do not leave. If you are a young physician who really wants to learn; to see a broad array of diseases and observe their progression, there are two places where you can get this experience. You can go to a third world country—or you can practice in a prison. I think this is a big selling point of Correctional Medicine that we have mostly failed to communicate to new recruits! There is no question that the fact that our patients do not go home has a big impact on medical practice. This is one of the reasons why Correctional medicine is such an interesting and great career! Can you think of any important differences that I have missed? Please comment! This entry was posted in Inmate issues, Jail culture, Lab Studies, Medical Practice, Practice Management, Studies, Uncategorized and tagged correctional medicine, inmates, jail medicine, jails, prisons on December 7, 2016 by Jeffrey Keller MD.